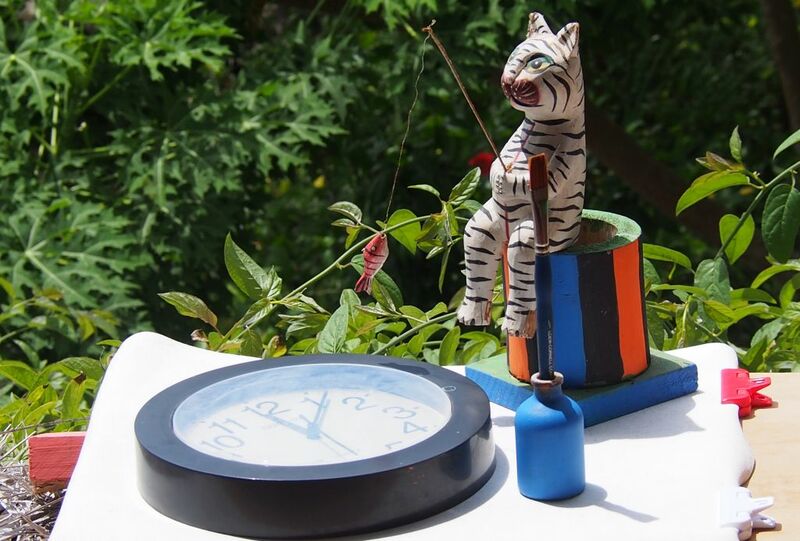 The fishin’ cat was a gift from my son years ago, and it presently fishes over my kitchen sink. It’s also posed for a portrait or two. 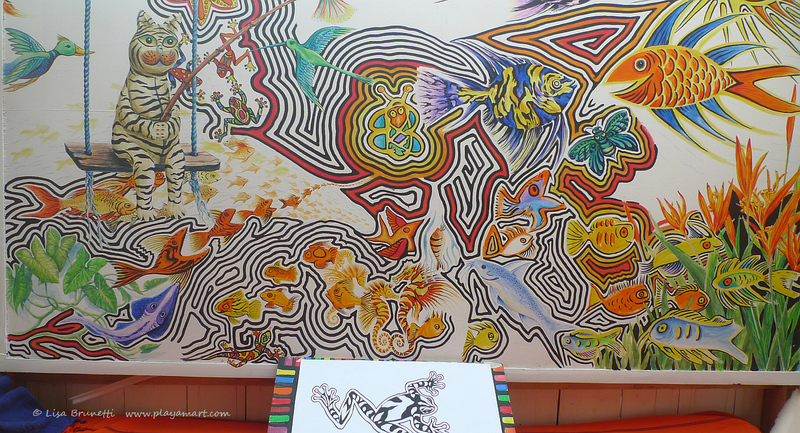 The painting was inspired by a fishing cat that my son gave me years ago! Natalia helped with some of the fish in the bottom right section. They’re some of my favorites, a combo of her line paintings with color and details added later by me. The other images are stuck in cyber limbo at Casa Loca, so this post closes sooner than planned. After 11 hours’ sleep, I’ll move forward today, poco a poco, but the joint pain is definitely much better. Today will be PAINTING DAY, and I predict a good day. 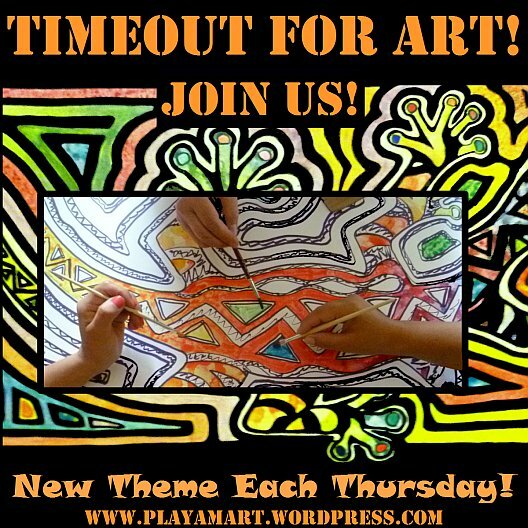 Take a timeout for art today and join me! Paint that piece of driftwood that’s begging for a touch of color or paint zebra stripes on a rock or draw a silly fish swimming in the sky… The choices are endless! so glad you are feeling better and less joint pain, but remember not to overdo! I love the fish from large to small to tiny reflecting each fish attempting to eat the other (my reflection). You spoke of painting on driftwood – I still have the driftwood that you painted a wildlife scene on with “Donaldson Point” at the bottom. Not saying how long ago that was because time notes continue to make me feel ancient! Love you my dear, sweet friend. Continue to heal! hey, i hope that your time away was fun, though you’re probably swamped with work. I forgot to mark the sun at noon on Solstice. I remembered around 4:00. Ah, it will come again. I love the quote and your painting makes me smile. So vibrant and pretty! Love love love your painting of the fishing cat. Such wondrous colours and patterns! there are good dayas and not so good days, but the fatigue hangs close. not sure if it’s dengue or chik related or a combo factor…. i paint for a few hours, stop for twice that long, then paint a little more. the hands are much better – yay! looks like kris is heading your way via bicycle? i’m so proud of her! yes! 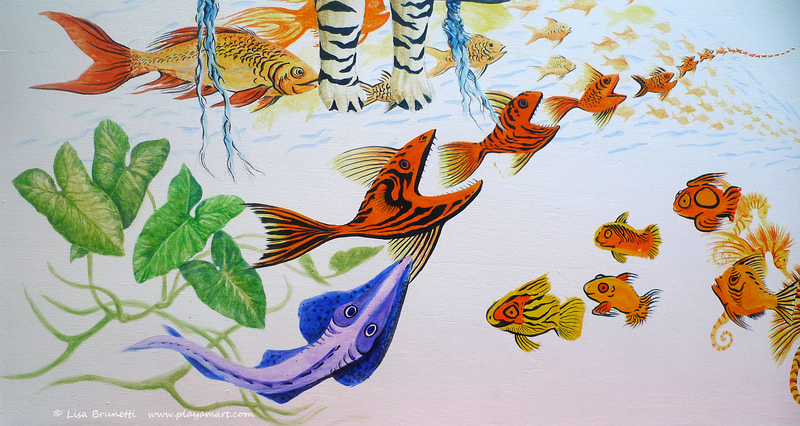 the thought of fish swimming through beautiful gardens and even in treetops always makes me smile. i’m glad you like that concept! maybe i shoujld do a serious series… hmmm – i need a zillion lives! That fishing cat is a cutey and such a patient poser… So pleased to hear you are well on the road to recovery. thank you amiga.. i regret that i’m unable to visit most of your posts, butone day i’ll have a slice of time and faster interent to admire every single one that i’ve missed. Just take care of yourself, no stress I’m sure we will all still be here when you are strong enough to return. yes; today has been another positive day.. if i make it through tomorrow with no pain, i think it’s a good sign that the worst is behind me! thanks! One can always use friends who have wit and a sense of humor! What a great whimsical way to start the morning! Thanks! I’ll carry that smirk with me through the day! A smirk at work is quite a quirk. “DOE-blee ” smiles this morning! When you travel with a Blues band in a bus on tour in N. Z. it is almost a must. I think you need uppers and downers because of the odd hours and the disruption to the sleep pattern. That cut a lot of the really great artists careers short. I just move the equipment round and helped with security and enjoyed being part of the experience. what a great story! have you written about your times on the road w/the blues band? your opening sentence here made me smile, andyes, the painted ‘poor man’s’ sneakers were a big hit. the shoes wear out fast, but they really make people smile, especially when the poor look down and see that i am wearing their shoes! haven’t painted a new pair in a while.. i shouuld do that soon. I have missed so much! Wonderful to cruise through your blog (and your mind) again. Thanks, and it’s good to be feeling stronger and moving forward. Now if there were a better internet option, I’d be soaring!